MINAMATA IS A FISHING TOWN beautifully situated on a bay in the foothills of the mountains on Kyushu, the southernmost of Japan’s four main islands. In 1908, the Chisso electrochemical company established a plant there. Labor and land were cheap, and water from the mountains supplied plenty of hydropower. Already in the 1920s fishermen had complained about the pollution of their fishing grounds in Minamata Bay , but Chisso was a major source of jobs and revenue and was able to make small payments to the fishermen in return for the right to continue polluting. By the 1950s the waste disposal practices began to catch up with the company, as the pollution’s impact began to be felt by inhabitants of Minamata and neighboring villages. Fishing was always a critical resource in Minamata. What the fishermen did not sell, they and their families and neighbors ate. In the early 1950s, mullet, lobster, and shad began to disappear from the once-fertile fishing grounds. Dead fish were found floating on the sea; birds dropped dead from the sky. The local fishermen had to borrow money to eat and to buy nylon nets in order to capture what few fish were left. Nets were often lifted out of the sea bearing only a heavy sludge from Chisso’s wastewater. The cats in the village started to dance crazily, bash themselves against walls, jump into the sea and drown. In 1954, Dr. Hajime Hosokawa, director of the hospital at the Chisso plant, began to see patients with impaired nervous systems. Mostly fishermen and their families, they had difficulty in walking and talking and suffered wild mood swings. Their bodies were racked with convulsions. Most disturbing, newborns were exhibiting symptoms, which indicated the presence of a congenital form of the disease. Local health officials conducted a survey of physicians in the area, and found that scores of patients had presented with similar symptoms, and that many of them had died. Especially affected were the fishing communities south of Minamata, often with several members of the same family afflicted. 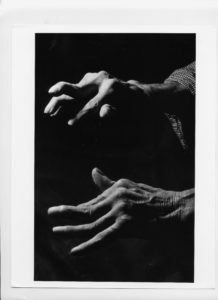 The gnarled hands give testimony to the effects of the mercury poisoning. Eiko Sugimoto was born in Modõ, a small fishing community just south of Minamata. Her father was the boss of the local net fishery, and as the only child, though a girl, she was expected to carry on the business. One day in 1958, she returned home from a fishing trip and found her mother confused and unable to light her cigarette; the floor was covered with matches. Sugimoto’s father took her mother to the hospital. Since this strange illness appeared to affect members of the same family, neighbors feared the disease might be contagious. When Sugimoto walked down to the shore to care for their boat, she was stoned by her friends and neighbors. Covered with cuts and bruises, she tried to find comfort and safety in a neighboring house. Instead, her neighbors threw excrement on her. Shopkeepers refused to touch the diseased, and made them pass their money in special baskets, or leave it on the floor so it could be picked up with chopsticks. When she and her father also felt sick, they hid it. Treated like lepers in their own communities, the victims felt deeply ashamed. Recriminations destroyed once-close fishing communities. As the disease spread through the mid-1950s, suspicions fell on Chisso’s wastewater, since it was widely known to have ruined the fishing grounds in the area. But no one knew what was in the wastewater, and Chisso was not providing any information. Researchers struggled with studies of a host of pollutants found in the bay and were not able to isolate any particular toxic material that would cause such a disease. In late 1958 a British neurologist, who had visited Minamata, suggested in The Lancet, that the disease’s symptoms were similar to those produced by organic mercury poisoning. Organic, or methyl, mercury concentrates in the brain and attacks the central nervous system, killing brain cells and turning the brain into a sponge, full of holes. Since it destroys nerve cells, there is no cure for severe cases. The poison can kill a victim in weeks, or slowly eat away at the body for years. Within a year, a pathologist, Dr. Tadao Takeuchi at Kumamoto University, confirmed the findings, and a special governmental research committee also found that organic mercury was the cause, although it did not attribute the mercury’s origins to Chisso’s operations. The government disbanded the committee as soon as the report was issued and transferred any further research to a group under the control of several trade ministers who were sympathetic to the company. Chisso executives tried to deflect attention away from its wastewater by advancing its own theory that the disease was caused by ammunition dumped in the sea at the end of the World War II. A researcher at Kumamoto University, Dr. Irukayama, discovered, however, that inorganic mercury used as a catalyst in the production of acetaldehyde in the factory was converted into organic mercury. He concluded that the illness was caused by the discharge from Chisso’s wastewater that contained organic mercury. Chisso disputed the charge and claimed that its wastewater could not be the cause since it used only harmless inorganic mercury in its production. The company did not share samples of its wastewater, so no one could disprove the claim. No one, that is, except Chisso’s own Dr. Hosokawa. The doctor had been conducting a series of experiments on cats by feeding them food sprinkled with various chemicals from Chisso’s processes. When he fed wastewater from the process that produced acetaldehyde to a cat, it exhibited the same symptoms as those afflicted with Minamata Disease. An autopsy of the cat and lab results confirmed that the cat’s cerebellum was destroyed, just as were the fishermen’s. Hosokawa informed Chisso management of the disturbing discovery. The officials ordered Hosokawa to stop his experiments, and the company destroyed all the cats. No replication of the experiment was allowed. Not only did Chisso deny that its production wastewater was responsible for the disease and suppress Dr. Hosokawa’s evidence, the company also steadily increased its production of acetaldehyde, and the mercury-laden wastewater. Production in 1950 was 450 tons per month; by 1956 it was 1,325 tons per month; and by 1958 it had increased to 1,500 tons per month. When the water in the sea near the point where the wastewater was discharged south of the plant became heavily polluted, the wastewater was diverted into the mouth of the Minamata River, north of the plant. Dr. Hosokawa warned Chisso against this diversion, but the company ignored him. Within a year, the disease emerged in fishing villages north of Minamata. Yet Chisso continued to increase the manufacture of acetaldehyde with its mercury byproduct, reaching 4,000 tons per month in 1960. As the disease spread, it became clear that it was related to the consumption of fish that had been contaminated with some toxic substance. Fishing catches had decreased by 90 percent since the outbreak of the disease, and what few fish were left in the area were seldom sold. At first the public simply stopped buying it. Later, the local government barred the sale of fish from the area, which only aggravated the fishermen’s financial plight. Fishermen began to hold demonstrations to protest Chisso’s destruction of their fishing grounds. The patients who suffered from Minamata Disease also began to organize. They camped out in front of Chisso’s plant and conducted peaceful sit-in demonstrations, with the help of a tent donated by Chisso union workers. The patients demanded financial support from Chisso to pay for medical and living expenses. Chisso dominated the economy of Minamata, contributing over half of the city’s tax revenue and over one-third of the jobs, and most of the local city officials were former Chisso employees. Because of this, most Minamata citizens were unsympathetic, even hostile to the patients. Through the intervention of the local government, Chisso agreed to a two part settlement. In November 1959 Chisso agreed to pay the fishing cooperative of 7,000 families ¥35 million ($98,000) as a lump sum compensation, but deducted ¥10 million ($28,000) for damage to its property during one of the demonstrations. Each family ended up with an equivalent sum of about ten dollars. Chisso also provided ¥65 million (about $180,000) for restoration of the fishing grounds, but this was in the form of a loan to the fishermen’s cooperative. Then in December 1959, Chisso agreed to also settle with the patients by offering a take-it-or-leave-it deal: ¥30,000 per year ($83) support for each child, ¥100,000 per year ($276) support for each adult, and a lump sum of ¥300,000 ($833) for each dead person, of which there were about thirty. Chisso offered the money only as a mimaikin, or condolence, rather than as a hosokin, or compensation. In Japan, the condolence is offered as a gift to those less fortunate, as a form of charity, in contrast to compensation that reflects an admission of responsibility for the harm. Moreover, it was traditional for those receiving a condolence to be grateful, and to never again ask for more. Through this deal, the company also was spared the embarrassment of having to ceremonially apologize to the victims. As part of the settlement, Chisso received a release from the patients to the effect that if proof ever emerged in the future that identified Chisso’s wastewater as the cause of the illness, the patients would be precluded from receiving more money from the company. The patients were unaware at the time that Chisso already had the proof, from Dr. Hosokawa and his cat experiments, that the wastewater was indeed the cause of their suffering. For seven more years Chisso discharged over 500 tons per year of mercury-contaminated waste into the sea. Since no one except Chisso’s managers knew of the continuing disposal of the toxic material, most people of Minamata believed that the problem had been resolved after the settlements in November and December 1959. Although more people began to show symptoms of the disease, the fishermen union pressured its members not to report any new incidence of the disease, to prevent further damage to the reputation of Minamata’s fishing resources. Families discouraged members from identifying themselves as patients, since it brought disgrace to the entire family. Culturally, the misfortunes of individuals and families were inextricably intertwined. Not everyone, however, was willing to deny the existence of the disease. One woman, Michiko Ishimure, came to be the voice of the victims of Minamata Disease through her chronicle of the suffering of the victims, Paradise in the Sea of Sorrow: Our Minamata Disease. Ishimure’s family was from the Amakusa Islands, across the Shiranui Sea from Minamata, and, like many others, her family had left the islands in search of work. While her grandfather and father were skilled stonemasons, the grandfather’s business ran into difficulties and Ishimure was raised with few physical comforts. Ishimure’s family lived near a cemetery and crematory, an isolation hospital, and a brothel. Ishimure visited the crematory and watched the smoke rise as the dead—epidemic victims, strangers, and the poor—were burned. She spent hours with the prostitutes—girls from poor fishing villages—sitting in their laps as they had their hair done by the local hairdresser. On occasion, she dressed like the prostitutes and paraded along the road. Her grandmother was blind and mad (unrelated to the mercury poisoning), and she went into fits: groping, clutching, and crying out with inhuman noises. She often disappeared from the house. Ishimure would go out looking for her so often that people referred to Ishimure as her grandmother’s shadow and to the grandmother as Ishimure’s little play doll. Once the Emperor of Japan was scheduled to visit the Chisso plant in Minamata. All vagrant and deranged people were to be relocated to a small island for the length of the visit. When a policeman came to inform Ishimure’s father that his mother would have to be removed, he refused, saying that he would kill himself rather than suffer such a disgrace. The grandmother was allowed to stay, and Ishimure vowed to follow her father’s fearlessness in standing up for those, like her grandmother, who needed protection. The dark poems did not sit well with many, but through her writing Ishimure met Gan Tanigawa, a young revolutionary poet and an activist in the Japanese Communist Party. Tanigawa’s fierce, uncompromising demands on literature and society toughened Ishimure. And she needed it, for she was about to discover the afflicted of Minamata. Tanigawa’s literary circle also included Satoru Akazaki, who worked for the city of Minamata. Akazaki obtained, without permission, a copy of what became known as The Red Book, a journal kept by doctors at a secret ward at Minamata Hospital, where the victims of the strange disease were quarantined. The details of the assaults on the victims from this disease formed an excruciating story for Ishimure. Ishimure’s exposure soon became more immediate. Her son contracted tuberculosis and was admitted to Minamata Hospital. The TB ward was right next to the ward housing the Minamata victims and she heard terrifying howls from the ward and saw fingernail scratches along the walls. Ishimure saw patients who were unconscious, others lying motionless, staring into space with the wide-open eyes. Kama Tsurumatsu, a 56-year-old fisherman, who seemed to be little more than a skeleton, frequently fell out of his bed. It was his falling out of his boat while fishing that had led his family to hospitalize him. Yet his eyes still pierced Ishimure, perhaps aided by the sunken cheeks in which they were set. The pain and sadness tore at Ishimure. The seemingly possessed Yukijo rests between fits of uncontrooled spasms. It was after they were married for only two years, in the mid-1950s, when Yukijo was forty-one, that the symptoms arrived. At first she dropped laundry that she was carrying on her back, without knowing that she had dropped it. Then her hands and legs started to go numb, and she began to stumble. Before long she could speak only in fragments, struggling with each word. Yukijo could no longer help Mohei with the fishing. She thought that perhaps these difficulties were the result of early menopause, or even from fallout from American and Chinese nuclear bomb tests. While in the hospital, Yukijo had an abortion because the doctors concluded that her life was threatened. After the procedure was done, fish was served for dinner. Yukijo thought the fish was her lost child. She spoke to it, touched it fondly, and ate it, thinking she was eating her dead child. When a group of dignitaries visited the ward, Yukijo went into a convulsion during which she suddenly shouted, “Long Live the Emperor!” followed by a rendition of the national anthem. The visitors fled. But the behavior served her well with other audiences. For she took to visiting the nearby TB ward, dancing like the cats used to, and singing. She earned cigarettes this way, and amused the patients. Yukijo spoke of herself as a “rickety, half-insane, drooling weirdo patient,” but at least she was only half insane. The half that remained sane accounted for the loneliness and isolation that she felt and expressed to Ishimure. Ishimure began to organize on behalf of the patients. She visited the patients and wrote down their testimonies and the horrors she witnessed. She paid a price for her involvement. Her family received threatening letters, and her parents put pressure on her to spend more time on wifely duties, caring for the household rather than for strangers. Eventually her family realized that there was nothing they could do to pull back Ishimure from the patients. Ishimure and her husband, Hiroshi, agreed to bring Ishimure’s younger sister to live with them to care for the household, and Hiroshi joined in Ishimure’s efforts, actively working with the teachers union and the patients. One of the families Ishimure visited was that of seventy-year-old Ezuno. Ezuno and his wife cared for their son, Kiyoto, and for Kiyoto’s three sons, all of whom suffered from the disease, including Mokutaro or Moku, who had been born with it. Kiyoto’s wife, Moku’s mother, had deserted the family. While Kiyoto might have qualified for some compensation from Chisso, he did not apply because it would have meant a loss of government benefits, and the Chisso payment was not enough to live on. But the government stipend also was not nearly enough to live on, so Ezuno, his wife, and weakened son, Kiyoto, were forced to fish periodically to make ends meet. Moku, the middle son, was almost ten years old when Ishimure first came to visit old Ezuno and the family. Moku could not walk or stand, he suffered from convulsions, and was not able to use his hands to hold chopsticks to eat. While handicapped in so many ways, Moku nevertheless was keenly aware of everything around him. This meant that he also was aware of his own body and his inability to control it. When Ezuno, his wife, and Kiyoto had to go fishing, and the remaining grandsons were in school, Moku was left alone at home to fend for himself. Of course, Moku could not fend at all. When Ezuno came home he knew right away if Moku had soiled himself; the shame on Moku’s face broke through whatever else he was unable to communicate. He would stare at his grandfather with wide, open eyes whose sadness bore heavily on Ezuno. But Moku stubbornly taught himself how to hammer nails, and his grandfather would find him hammering nails into a wall or some loose board. Moku’s blistered hands demonstrated the determination he possessed. It pained Ezuno to realize that there would be no one to care for Moku when he died. In the struggle to gain recognition for the victims, Michiko Ishimure was joined by Jun Ui, then a young scientist and budding environmentalist, and a photographer, Shisei Kuwabara. The two were documenting the effects of the poisoning on patients throughout the Minamata area. On a visit to the Chisso Company Hospital in 1962, Ui noticed by chance a document marked, “Confidential.” Undeterred, Ui read the document and discovered a reference to Dr. Hosokawa’s experiment with cats, in which effluent from the acetaldehyde plant, containing ten parts per million of mercury, produced symptoms in the cats that mimicked those in the patients. Kuwabara surreptitiously photographed the document. Ui tracked down Dr. Hosokawa who confirmed the results of his experiments but warned Ui about the risks of publishing the story. At the time, the chemical industry and the government were exerting intense pressure to suppress any publicity that would adversely affect Japan’s postwar economic growth, and many of the leading faculty at Ui’s university worked for the chemical industry. 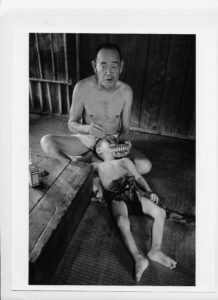 In 1964 Kuwabara published his photographs of the victims, providing some of the most moving images of the impact of the disease on the victims. Ui wrote an introduction but did not reveal the secret experiments with the cats. While Ishimure and others continued to fight on behalf of further support for the expanding numbers of victims, the company, the government, and most of the people of Minamata continued to deny the scope and cause of the disease. It was another tragedy elsewhere in Japan that reinvigorated the patients’ efforts. In 1964-65, the very same symptoms of the Minamata Disease showed up near Niigata City. The victims, mostly poor farmers and fishermen, lived along a river near Niigata City, and their diet depended heavily on fish. As in Minamata, a government-sponsored committee was established. The committee, along with independent investigators, pinpointed the source as another chemical company, Showa Denko, which produced acetaldehyde in much the same way as Chisso, with similar consequences. Also as in Minamata, the government suppressed the committee report and, under pressure from the trade ministers, withdrew funding for further research. The chemical company adopted Chisso’s pattern of denial. For several years, the victims in Niigata were no more supported than their counterparts in Minamata. But there were several critical differences in Niigata. The chemical company was located some forty miles upstream from Niigata City where the disease was spreading, and the city did not depend on the company as Minamata did on Chisso. Moreover, Japan now had witnessed two instances of mercury poisoning as a result of environmental pollution from the chemical industry. These instances and several other notorious acts of pollution eventually raised the environmental consciousness of the general public. The incidents also attracted the attention of young, socially committed students and lawyers, often from the growing Japanese Communist Party. As a result of these converging forces, a lawsuit was filed against Showa Denko on behalf of the victims of the disease in Niigata. The filing of the lawsuit was an extraordinary event. While in some cultures, such as the United States, filing a lawsuit is a common step taken to resolve a dispute, in Japan it was rare and disfavored. To sue for personal compensation indicated that the community was not functioning properly, that individual rights were superior to community interests. This same attitude made it difficult for the victims in Minamata to be identified as deserving of special treatment. Thus, against all odds and tradition, the Niigata victims sued in 1968. The Niigata lawsuit gave hope to the victims in Minamata that something might still be done to force Chisso to accept its responsibility. Ishimure published articles in the mid-1960s, and it was her writing—poetic and empathic—that drew increasing attention to Minamata Disease and the struggles of the victims. Around this time, after the Niigata outbreak, Ui decided that he could no longer withhold information about Hosokawa’s experiments. Working with Ishimure and her husband, Ui organized his research and published his findings in a limited distribution journal under an anonymous name. One problem that remained intractable for the victims was the process of verifying whether a person was suffering from Minamata Disease. Since the initial settlement in December 1959, a procedure had been set up to certify any new individuals who claimed to be afflicted, and a Council for the Verification of Minamata Disease was formed. The process was slow and frustrating. The screening council was heavily influenced by Chisso, and its members treated the patients as greedy, unworthy supplicants. Most applicants were rejected. In fact, between 1959 and 1968 only thirty-two individuals were certified as having the disease, almost half of whom were congenital cases. This number was in addition to the close to eighty patients previously recognized, for a total of 111 patients, forty-two of whom had already died. Certification meant that the individual was qualified for the sum that Chisso agreed to pay in 1959. But it also meant that the government would withdraw whatever benefits it was providing to the individual, and the community at large would dispense its scorn on the individual. The community saw any increase in officially recognized patients as a threat to their jobs, to the city’s economic base, and to any hopes of reviving a cottage fishing industry. As one member of the Minamata community remarked, “Whose life is more important, that of one hundred eleven Minamata Disease patients or that of fifty-five thousand townspeople.” Without any official recognition of Chisso’s responsibility for the disease, certification remained complicated. In 1968, the national government enacted the Pollution Victims Relief Law, which provided for the central government to take over the certification process for Minamata Disease. Contrary to expectation, the patients did not fare much better after the law was enacted. The criteria for verification remained constricted and the number of approved patients remained low. In 1966 Chisso finally controlled the discharge of mercury from its plant through the installation of a new circulation system. In 1968 Chisso ceased production of acetaldehyde, not because of any concern for the environmental damage it was doing, nor because of the devastation that it was wreaking on the people of Minamata, but simply because new technology had made the product obsolete. Only after Chisso ceased production did the government officially conclude that Chisso’s contaminated wastewater had been the cause of Minamata Disease. However begrudging this official recognition must have seemed to the victims of the disease, it justified their long struggle to resolve the issue. Chisso, however, still refused to acknowledge its responsibility. Shortly after government recognition of the disease, patients once again held a sit in at Chisso’s plant, demanding fair compensation, not the paltry condolence that had been doled out ten years earlier. Chisso indicated that it would not engage in direct negotiations with the patients. It would instead only agree to binding mediation with the local government that would set a rate of payment for the patients, which they must accept without further complaint. The offer of mediation caused a split in the certified victims group. Some fifty families, all of whom had been certified as having the disease, agreed to binding mediation. It was viewed as the traditional method for resolving disputes. After about a year of mediation, each living certified patient was provided a lump sum payment of ¥1.9 million ($5, 515 in 1968), a maximum annuity of ¥180,000 ($155), and a medical allowance. Each family of a dead certified patient received a maximum sum of ¥3 million ($11,100). Thirty families who were certified filed a lawsuit against Chisso in June 1969 that was modeled on the Niigata litigation. The lawsuit brought more antagonism from the community. The victims were seen as declaring themselves worthy of special consideration and attention, and as unwilling to endure their suffering in passive silence. The patients now at least had the support of some of the Chisso workers. During the earlier protests by the patients in front of the Chisso plant, the workers’ union had been largely hostile. But in 1962 a contentious strike had spilt the union into two factions. One faction sided with the patients’ efforts and even issued a “Shame Declaration” in 1968, apologizing for its earlier actions in defending Chisso’s conduct and condemning the patients. Their support took an even more valuable turn as members of the faction secretly released confidential Chisso documents to the litigating patients. The litigation group also received support from Ishimure. Ishimure’s book, Paradise in the Sea of Sorrow: Our Minamata Disease was published in January 1969, and it movingly depicted the effects of the mercury poisoning on the ordinary villagers of Minamata. The non-victim community in Minamata saw the book as a threat to their reputation and financial security, but throughout the rest of Japan, the reaction was positive. The book received widespread admiration, capturing a major prize for nonfiction, and fueled public interest in the plight of the victims. Ishimure refused the prize, claiming that she did not want to gain personally from the suffering of the victims. She also did not want to subject her family to further abuse on the pretext that she was writing about the victims for personal profit. Ishimure’s writing also attracted the attention of the famous American photographer W. Eugene Smith. 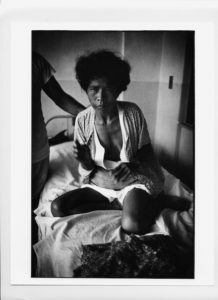 Smith and his wife Aileen Mioko Sprague stayed in Minamata for three years photographing victims and documenting the disease. They lived simply with a family of one of the early victims, sharing part of the modest house and eventually renting a barn for a darkroom and workspace. Aileen photographed along with Eugene, acted as interpreter, undertook the necessary research, and shared in the writing, layout, and printing of photographs for the project. Smith could speak only a few words of Japanese but he went everywhere, observing, and photographing the victims and their families. He was so ubiquitous, with cameras and lenses hanging all over him, that the locals called him “the camera store operator.” As omnipresent as he was, Smith was also patient, never intruding, always waiting for that perfect moment, the perfect photograph. Smith was particularly drawn to one young patient, Tomoko Kamimura, and her family. Tomoko was born with the poison and was limited in speech and bodily control, at most capable of uttering, “Ah, ah.” Tomoko’s parents refused to hospitalize her and cared for her at home. Tomoko was seen and treated as a special gift, rather than as a burden. The other children in the family did not have the disease, so it was thought that Tomoko carried the full vengeance of the disease in order to spare the others. Tomoko became one of Smith’s favorite subjects. He and Aileen lived near Tomoko’s family; they walked by frequently, even babysitting for Tomoko while her parents attended rallies and protests. Smith’s photo of Tomoko being bathed by her mother—a modern Pietà—remains one of the most compelling photographs of the twentieth century. Tomoko was certified, but many others were turned away. Once denied the status, there was little the victims could do. One victim’s son Teruo Kawamoto, however, challenged the government’s system. Kawamoto cared for his father throughout his illness, and he was angry that the bureaucracy had denied his father the recognition that he deserved. Even after his father’s death, Kawamoto pursued his father’s claim for certification. When told that there was no way of proving the claim since his father had died, Kawamoto dug up his father’s corpse and delivered it to the hospital, demanding that an autopsy be performed to prove that his father died of Minamata Disease. Kawamoto too began to feel the effects of Minamata Disease, but he resolved not to go quietly into the night. Together with Ishimure, he waged a campaign to widen the group of those eligible for certification. In August 1971, the recently formed Environment Agency overruled the decisions of the local board to deny certification, and recommended that much less restrictive criteria be applied to the victims. As a result, Kawamoto and the others who had appealed were certified in October 1971, and there were an additional 538 individuals certified between 1971 and 1973. Even after these changes, the certification process remained unsatisfying to Kawamoto and the other victims. Being certified only made Kawamoto and the others eligible for the small sum specified in Chisso’s condolence. It was not the size of the condolence, however, that disturbed the victims, but the nature of the condolence. The compensation was dispensed through a third party, which allowed Chisso to distance itself from the victims. Even the litigation depended on an intercession from a third party, the court, to force Chisso to accept responsibility. During the ongoing trial, only Chisso’s lawyers attended, not Chisso’s key staff. The victims could tell their stories to the judge, but there was no opportunity for the victims to confront those responsible. Kawamoto wanted direct, face-to-face negotiations with Chisso, particularly its president. He felt that only by engaging Chisso face-to-face could the company be forced to acknowledge its responsibility for the suffering it had caused the victims and their families. In November 1971, Kawamoto organized a direct negotiations group. Their efforts were fueled by the victory in the Niigata litigation where, in September 1971, the court found in favor of the victims and found the chemical company negligent. Ishimure, as ever, worked with Kawamoto to organize a sit-in tent in front of Chisso’s plant in Minamata. Ishimure and Kawamoto also coordinated their efforts with the court group. But Ishimure knew from her experience with the first sit-in, in 1959, that the victims were in danger of being marginalized by the wider Minamata community and were being pressured to submit their claims to third-party mediation. So Ishimure and Kawamoto decided to expand the protests to Chisso’s headquarters in Tokyo, as well as maintaining the protests in Minamata. On December 7, 1971, Kawamoto and Ishimure, along with several hundred supporters, appeared at Chisso headquarters in Tokyo and presented their demands for direct negotiations. The group demanded ¥30 million ($90,000) for each patient as well as an apology from Chisso. For many, an apology from Chisso and its acceptance of responsibility for the problem was the primary goal of their efforts, not financial compensation. The next day they returned to get Chisso’s response. They met with Kenichi Shimada, Chisso’s president. For thirteen hours, the victims spoke of their suffering and the suffering of their children, and pleaded with Shimada to intercede, to accept responsibility, and to make them whole again. Some were shy and reluctant; others were angry. Kawamoto was impassioned. He cried when he spoke of his father dying alone, in a mental hospital ward, without any recognition of what had been done to him. He produced a razor and pleaded with Shimada for the two of them to cut their fingers and seal in blood an agreement to settle things. The experience was too much for Shimada. He collapsed and was carried out on a stretcher. While recovering, Shimada drafted a memorandum suggesting that the company turn the plant over to the victims and their supporters as compensation for their suffering. Given the culture of Chisso, nothing could come of such an idea. With the talks suspended, the protesters camped out in Chisso’s offices to wait until Shimada agreed to meet with them again. After several weeks, Chisso workers forcefully threw Kawamoto, Ishimure, and the others onto the street. Undeterred, the victims set up a tent outside, as they had previously done at the Minamata plant, to continue the protest. The forcible ejection received widespread publicity, and the ranks of the victims’ supporters grew. Kawamoto felt that the Chisso union should not be acting as Chisso’s enforcers. Most of the workers involved came from Chisso’s plant in Goi, so Kawamoto decided to visit the leader of the union in Goi to encourage them to desist. On January 7, 1972, Kawamoto, some supporters, and members of the press, including Eugene and Aileen Smith, traveled to Goi for a meeting between Kawamoto and the head of the Union. When they arrived, Kawamoto was informed that the union leader was in Tokyo and not available for any meeting. Kawamoto tried to deliver a set of demands but a group of Chisso workers charged and beat them, particularly singling out Smith. Smith was kicked in the groin, and then several of the Chisso workers picked him up and slammed his head against concrete, knocking him unconscious. Smith developed recurrent dizzy spells, a constant pain in his left eye, and blurred vision in his right eye. Sometimes he would faint if he tried to lift his hands to use the camera. When whiskey was not enough, Smith got painkillers at the local hospital, and occasionally traveled to Tokyo for treatment by a chiropractor. Eventually, he went to New York on several occasions to get treatment, always returning to Minamata where Aileen had remained to work on their book of Minamata photographs. The attacks by the Chisso workers aroused a public outcry. Yet, despite the critical climate and pressure on Chisso from the Environment Agency, further talks were fruitless. Chisso even had Kawamoto criminally charged for attacking Chisso workers at one of the confrontations at the Tokyo headquarters. While the trial of the victims’ claims against Chisso was proceeding, Dr. Hosokawa was dying of lung cancer in a Tokyo hospital. Dr. Hosakawa had been loyal to Chisso even after retirement, and yet he was deeply troubled by what he knew about the discovery of the cause of the disease. When the disease broke out in Niigata, Jun Ui asked Hosokawa to visit Niigata and confirm the disease. Hososkawa did so, and when he returned he asked Chisso to release him from his obligation to remain silent about the cat experiments. Chisso refused. Ishimure visited Dr. Hosokawa in the hospital and he asked about the children born with the disease—were they growing, were they feeing better? Then he took Ishimure’s hand and held it to his chest and asked her if she could feel a lump. That was the cancer, he told her. There was more on Dr. Hosokawa’s chest. He spoke about the need for repentance, not only for himself but also for the Chisso managers. He recognized that the clock could not be turned back and the damage undone. But he felt that if the company officials did not move quickly to repent, then they could not be redeemed and the evil would grow and worsen. At the trial Hosokawa provided a deathbed testimony that shocked the wider public. He testified about his discovery of the link between the acetaldehyde production wastewater and the disease, back in 1959 when Chisso was settling cheaply with the patients; and, he testified of Chisso’s suppression of the experiments and destruction of the cats. His revelations exposed Chisso’s conduct of continuing to discharge mercury from the acetaldehyde process knowing that its wastewater was likely the cause of the devastating disease. Hosokawa died several months after his testimony, and the victims erected a small shrine to him outside their protest tent. The trial verdict was delivered on March 20, 1973. Chisso was excoriated. The Kumamoto District Court found Chisso grossly negligent stating “no plant can be permitted to infringe on and run at the sacrifice of the lives and health of the regional residents.” The court also nullified the solatium/condolence agreement of 1959, holding that Chisso took advantage of the victims, and that Chisso continued to discharge wastes contaminated with mercury even after it knew of the link between its wastes and the disease. In response to Chisso’s defense that it could not foresee the harm it caused, the court replied that the victims were not guinea pigs. The court awarded ¥937 million ($3.6 million) to the thirty families. These awards were substantially higher than the awards granted through mediation. The judgment of the Kumamoto District Court was an end but not the conclusion. The litigation victims joined forces with Kawamoto’s group and demanded face-to-face negotiations with President Shimada for medical expenses and annuities, in addition to the lump-sum death benefit payments awarded by the court. The groups insisted that all victims, including the leave-it-to-others, receive the same compensation. Most of all, they wanted an apology from Chisso. Chisso agreed to face-to-face negotiations. Once again, Kawamoto, who had organized the earlier negotiations and confrontation with the union in Goi, sat like a specter on top of the table, cross-legged, staring directly into Shimada’s face as they spoke. At one point, Kawamoto asked Shimada if he had any religion. Shimada said he was a Zen Buddhist and that he kept a small shrine with the names of all the victims and prayed there. Yet the talks dragged on. Frustrated with the delays, one of the victims got up, shaking, and smashed an ashtray on the negotiating table, cutting his wrists with the jagged edge. Shimada could remain silent no longer, and shouted, “We’ll pay, we’ll pay.” Chisso finally agreed to a global negotiation with all the groups and a settlement was reached in July 1973. Under the settlement, each of the certified patients received a lump sum of ¥16–18 million ($51,000–$59,000), plus a lifetime monthly pension. In addition, Chisso agreed to pay for medical and economic aid, and 65 percent of the cost of cleaning up the bay. Perhaps most critical for the victims, Chisso apologized to them and to society. In addition, criminal charges were brought against a former Chisso president and plant manager for manslaughter. The charges were reduced to professional negligence, they were found guilty, and the Japanese Supreme Court upheld the convictions. With the determination of Chisso’s responsibility settled, clean up of the contaminated bay proceeded. A three-mile-long net was stretched across the bay to prevent fish from leaving the contaminated area. Then the government excavated approximately 2 million cubic yards of mercury-contaminated sediment from the bottom of the bay and created a landfill parkland of about 143 acres. By 1997, the remediation was complete and the net was removed. The government declared that fishing in Minamata was once again safe. Those who were exposed to the mercury poisoning did not feel so protected by their governments. Many felt that the regional and national governments were as culpable as Chisso. Several lawsuits were brought against the governments, charging them with failing to investigate the poisoning and failing to determine early on who had eaten the mercury-contaminated fish and the extent of their injuries and symptoms. In the period after World War II, when economic expansion depended on the chemical industry, governments supported Chisso in its efforts to avoid responsibility, and held environmental and health concerns secondary to their economic goals. Victims pressed one case all the way to the Japanese Supreme Court. In October 2004, the court ruled in favor of the victims. It found that the national and prefecture governments had failed in their responsibility to identify the source of the mercury poisoning and to stop it, and that the governments had exacerbated the suffering of the people. Sugimoto, who was marginalized as a young woman by her neighbors, continues to fish in the bay and lives happily within the community that has begun to heal itself from the rupture of this disaster. Yukijo remained hospitalized on an island off the coast, where she had moments of lucidity and often played music. She died in the early 1970s in her late fifties. Kawamoto remained actively involved throughout his life, helping uncertified patients, working to establish the Minamata Disease Center Soshisha, an important resource and support center, and becoming a city councilman. He died in 1999 at the age of 67. Following the verdict, Eugene and Aileen Smith remained in Minamata to finish their book. In early 1974 they returned to the United States and, in 1975, published Minamata to wide acclaim. The photo of Tomoko in her bath was among Smith’s last great photographs. Tomoko died in 1977 at the age of 21; Eugene Smith died in 1978, following a stroke. At a private graveside service, a telegram arrived from Minamata that read, “We come upon the unexpected news of your death and profoundly cannot endure our grief. Your history is our courage itself. We pledge our inheritance of the mighty footsteps you left behind at Minamata.” Aileen Smith returned to Japan and now directs Green Action, an important anti-nuclear organization in Kyoto. Michiko Ishimure continues to provide comfort and courage for the patients, and to write about their suffering. She has written a Noh play, Shiranui (Sea Fire), about the sea around Minamata and the tragedy it released. The play was performed in 2004 on the area of the sea that was converted to land to protect people from further exposure to the poisonous mercury. Moku persists. His grandfather, Ezuno, died, as did his grandmother, but he is cared for at Meisui-en, a facility established for Minamata Disease patients. While he remains in a wheelchair, and his physical movements and speech are severely limited, Moku has become an accomplished photographer. He was trained by Kuwabara, the photographer who, with Jun Ui, discovered the secret document of Dr. Hosakawa’s cat experiments and who produced some of the most moving photographs of Minamata patients. Moku‘s photographs have been published and exhibited. His pain and persistence embody the courage and struggle of those deeply affected by Minamata Disease. Chisso’s economic dominance allowed it to get away with denying responsibility for those suffering from the poisoning, to pay a pittance to the early victims, and to continue to discharge the toxic wastes even after it knew that the wastes were causing the suffering. Externally, the company aligned itself with commercial interests within the government that turned a blind eye to the company’s culpability and to the victims’ suffering. Under the circumstances, and given the importance within Japanese culture of preserving the cohesion of the community, it is remarkable that individual victims had the courage to fight the company, the government agencies, and their neighbors and community. In the long run, the victims’ tenacity served them well as they formed various victim and support groups, organized sit-ins at Chisso facilities and demonstrations in Minamata and Tokyo, and initiated lawsuits against Chisso and the governments. It is likely the tough independence of the fishing people and comfort from family members allowed them to endure. The struggle was certainly blessed by the moving writing of Michiko Ishimure and the compelling photographs of Shisei Kuwabara and W. Eugene and Aileen Smith. Throughout the chapter, the dollar equivalents are for the applicable time period. Ishimure changed the names of many of the patients she wrote about. A pseudonym used by Ishimure in her book. At the request of Tomoko’s father, Aileen Smith has withdrawn the photo from further publication. From Robert Emmet Hernan, This Borrowed Earth: Lesson from the Fifteen Worst Environmental Disasters around the World (in English, Palgrave Macmillan, 2010; in Chinese, China Machine Press, 2011).